The 2017 Honda Civic Type R officially goes on sale today, which means it’s finally earnestly going toe-to-toe with the Ford Focus RS, Volkswagen Golf R and Subaru WRX STI in the battle for U.S. sport compact supremacy. Here’s how they compare on paper. We know you can get a hell of a lot of car in the $35,000 to $40,000 neighborhood now. Go back and read any of our writeups on the Type R’s rivals and you’ll see it’s hard to pick a dud. But some have got to be better than others, right? Until we get the chance to see these cars throw down for real, we’ll have to make due with bench racing off the spec sheets. So here’s some ammo for your lunch table arguments over which sport compact car is “best.” Just keep in mind that there will be much more to this story soon, like when somebody actually puts this fiercesome four on a track together. The Honda, Ford, VW and Subaru all run four-cylinder engines with four valves per pot and a turbocharger. The Subie uses a flat boxer engine in which the cylinders “punch” toward each other, a signature of the company, while the others are all inline. As you can see, the Focus RS is the runaway winner when it comes to overall output, but the Civic Type R beats the rest on horsepower and torque. Of course, it’s also the only front-drive fighter in the mix and the Golf R has a transmission advantage with the DSG option. If you’re into that kind of thing. Interestingly, none of these automakers’ American press offices have been particularly noisy about top speed or 0 to 60-time claims. As a result, I had to dig through the British version of the Honda, Ford, Volkswagen and Subaru media websites for these figures. They report acceleration as 0 to 62 mph not 0 to 60, so it translates more easily to kilometers for their European neighbors- 62 miles is almost exactly 100 kilometers. Anyway, looking at the numbers I did find, you can see why Honda has been hush. The Focus RS dusts the Type R from stopped to the speed limit by a full second. Then again, I would not have guessed the Civic would have had the highest top speed claim in this lineup, but there you go. 169 mph in a Civic... what a time to be alive. And yeah, I saw the Golf R’s DSG acceleration time. Sure is a gut-punch to your ego if you think you’re good at shifting, but I’d still have three pedals over a quicker car. The Civic wins on weight, by the amount of an entire adult passenger too! I think you can thank the lack of all-wheel drive for that, partially, but 188 pounds is a lot of heft to beat the second-lightest (Golf R) by. And the faster Focus RS is over 300 pounds porkier. You’re absolutely going to feel that in turns, regardless of the Ford’s advantage on 0 to 62 times. I also found it interesting that the Civic Type R is long, with the longest wheelbase of this bunch. That’s going to help high-speed stability for sure, though as you’ll see soon, it seems to have hurt the car’s turning circle. The Civic’s more front-biased weight distribution shouldn’t surprise anyone since, again, it’s the only front-driver of the bunch. The WRX STI sure is thirsty. Likely a byproduct of its larger displacement, I suppose, at least in part. All these cars want premium fuel, and although the spec sheets claim they can run on regular I wouldn’t feed my own anything less than 91 octane. Fuel economy aside, which is going to vary wildly on all these cars depending on how hard you’re driving, let’s take a look at aerodynamics. A car’s sleekness is generally measured as a “drag coefficient” and the lower it is, the more aerodynamic the car. Aerodynamics, of course, are a significant factor in how quick, stable and efficient a car is. Based on this data, it looks like all those vents, kinks and canards on the Civic Type R really paid off- a drag coefficient of 0.26 is insanely slippery! For your reference, a Porsche 911 Turbo’s cD is 0.31 and a Jeep Wrangler is apparently at 0.50. Backtracking, I found one site stating the ninth-generation European Civic’s cD as 0.27, so I just found three percent of that (0.0081), took it out of the old car’s number, and rounded down from 0.2619. I told my contact at Honda about this vague methodology and will update this post if he’s implored to clarify for us. But for now, I’m calling the Civic Type R the most aerodynamic of these four sport compacts. The Civic Type R rolls on freaking dubs and the high-performance tires wrapped around it have about as much sidewall as a rubber band. If you’ve ever seen 20-inch rims on an old Civic you’d spit your drink out of your nose, but they actually look pretty slick on the new car. Still, I can’t help but wonder if Honda could have relieved some unsprung weight and increased ride quality by running with smaller wheels. In addition to having the tallest wheels, the Honda also has the widest wheel track, which could give it an edge on cornering stability. But the shorter Golf R wins on having the smallest space to make a U-turn. 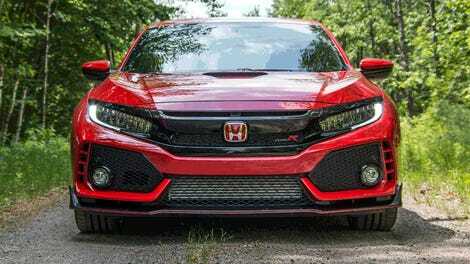 Finally, here’s why Honda has been bragging about the cost of admission to its new hot hatch. 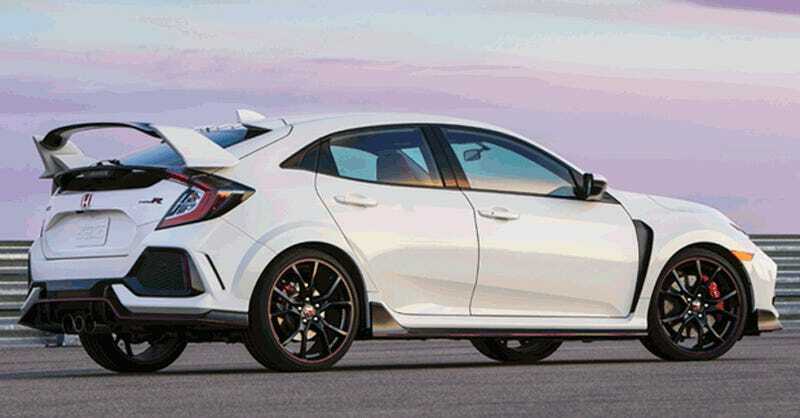 The Civic Type R comes in a couple grand shy of its rivals. But to be honest, if you’re willing to spend $34,000 on a car, are you really going to pass on one you want more because it’s $36,000? MSPR is a weak real-life comparative figure anyway since dealerships control this cost to you, not the automaker. It’ll be interesting to watch for reports in the coming weeks and months of how much the first few Civic Type Rs really end up fetching after dealers make their own price adjustments. I didn’t dig up this data so we could crown a “winner,” I just wanted to put all the facts and figures that will be dragged out in comment threads and car conversations over the next few months into one place. 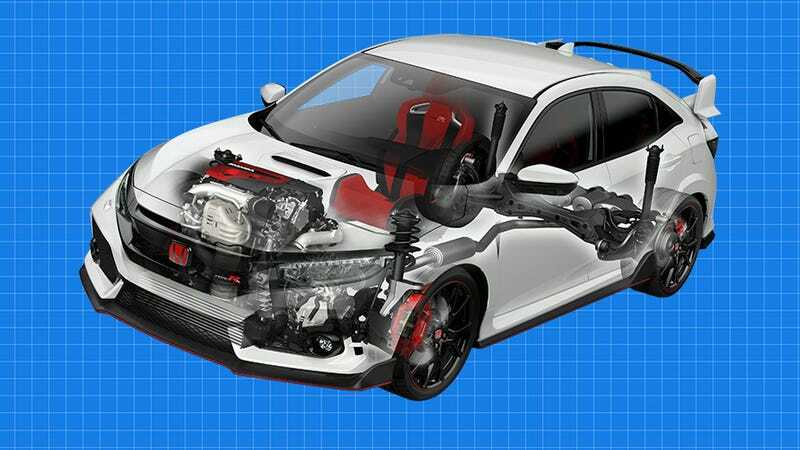 The Honda Civic Type R, Ford Focus RS, Volkswagen Golf R and Subaru WRX STI all have their own appeal and now you’ve got some quantification of their strengths and weaknesses.